STATE FAIR—–Corrrnnee! Pretty hard to handle except as camp, and too long at 118 minutes to sit still with that in mind. In 1962 plonks the third (1932,1945) version of a Phil Strong story set at the Iowa State Fair, concerning the romantic-comedic escapades of your basic All-American family of four. Dad (Tom Ewell) has a hog to show; Mom (Alice Faye) has pies to gobble; Sis (Pamela Tiffin) meets a jivey-too-cool Romeo (Bobby Darin); and Junior (Pat Boone) gets his wholesome mitts on the Cornbelt’s hottest tamale (Ann-Margret). Music is by Rodgers & Hammerstein, as in ’45, along with five new tunes, all equal in their lack of specialness. 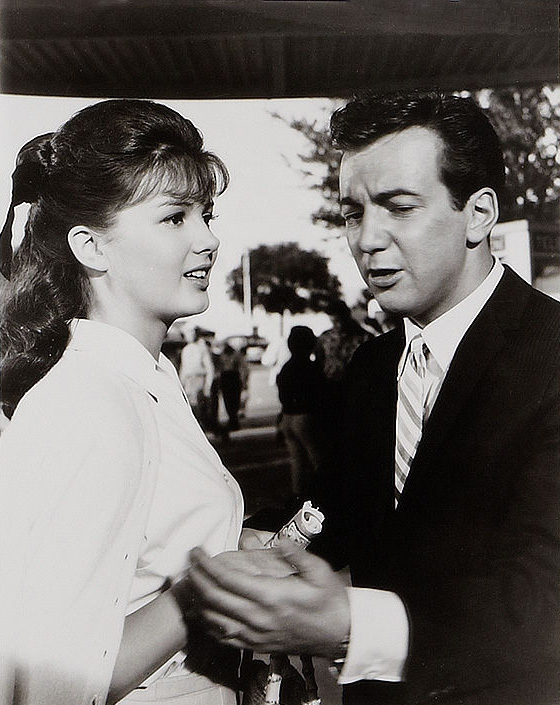 Some of the shots of the commotion at the fair are pretty, and Ann-Margret heats up a dance number with her amazing figure, but otherwise it’s square as a preachers hair. Directed by Jose Ferrer, it fizzled out at #23 for the year. With Wally Cox, David Brandon, Clem Harvey and Robert Foulk.